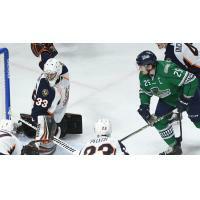 GREENVILLE, S.C. - The Greenville Swamp Rabbits went up against the league's best, and could not keep up with the best offense in the league. Florida raced out to a 4-0 lead and held on to the Swamp Rabbits' third-period push and won 4-1 over Greenville on Saturday at the Bon Secours Wellness Arena. The Swamp Rabbits were gifted a five-minute major power play in the first 32 seconds of the game. However, it was the Everblades that took advantage of a disadvantage. Kyle Platzer sprung Joe Cox on a breakaway, and his triple deke opened the scoring at 4:53. Former Swamp Rabbit Tommy Thompson converted late in the period on a tic-tac-toe passing play to double the lead. Florida would strike twice more in the second period, with goals from John McCarron on the power play at the netmouth, and Matt Finn on a picture-perfect snap shot from the left wing side. Kamerin Nault continued his scorching hot ways for the Greenville Swamp Rabbits, having scored his third goal in two nights. Nault has four points in five games since joining the club from the University of Manitoba. After coming out of the corner, Nault was fearless driving to the goal, and converted on his own rebound to cut Florida's lead to three. The 'Blades hung on to the lead for the rest of the way to sweep the season series. The Swamp Rabbits close out the season-long homestand on Monday, February 4 against the Atlanta Gladiators. Tickets are available at SwampRabbits.com.